"We can't afford. If this goes on a year at $200 dollars a day — that's a lot of money,” said Barry Lawrance. LUTZ, Fla. — Bearss Groves is where locals have shopped for fresh food for 25 years. The popular, open-air produce stand is located near Bearss Avenue and Lake Magdalene Boulevard. "I started working here when I was 13 in 1993 and it's just grown from there,” said Owner Barry Lawrance. Lawrance bought the business and property in 2012. "It's a farm operation and it's really in my blood,” he explained. Once an orange grove for more than a century, now you'll find lettuce flourishing in a hydroponic greenhouse. The produce stand sells everything from oranges to honey to heirloom tomatoes. But Lawrance says his livelihood is at-risk after being hit by $200 a day code violation fines from Hillsborough County. "If the fines continue and they decide to pursue the path they're going, it will shut us down. We can't afford. If this goes on a year at $200 dollars a day — that's a lot of money,” said Lawrance. Now the business owner is also facing criminal charges for violating a noise ordinance. A homeowner just over a wall complained to Hillsborough County the greenhouse exhaust fans are too loud. That’s crime, a second degree misdemeanor, in Hillsborough County. That neighbor, John Chapman, spoke with me off camera outside a Tampa courtroom this afternoon where the case came before a judge for a disposition hearing. Chapman’s written statement says the fan noise is so loud you can hear it, "inside our home with all windows and doors closed." And for ten months, he writes, he and his wife have been sleeping in a front guest bedroom. "I feel that they've moved next to the airport and now they're complaining about the airplanes. It's been here 125 years,” said Lawrance. The greenhouse fans are fairly new installed in March of 2018 which is years after Chapman moved in next door. 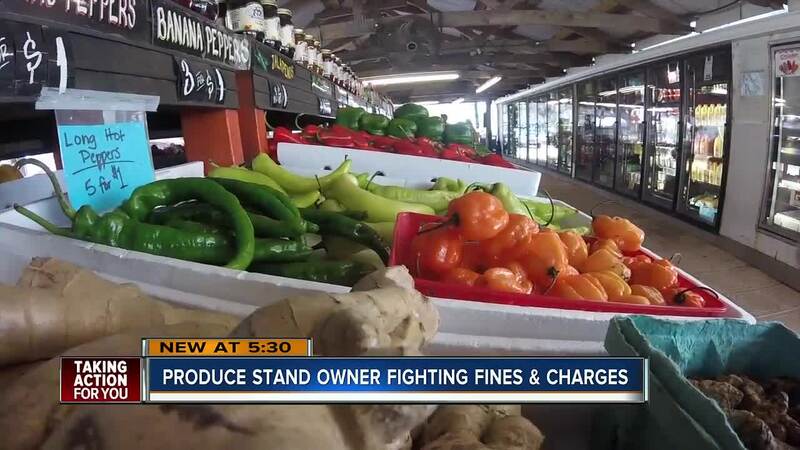 But Lawrance tells me a state statute, the Florida Farm Act, protects his operation and he doesn't plan to stop growing or selling. "Then urban sprawl could take over every farm in Florida. They move next door. They file a lawsuit. They complain a nuisance before you know it all the farms are gone. This is why it's here to protect us,” he said.